Do you remember Slap-It bracelets? Or what about Pogs? 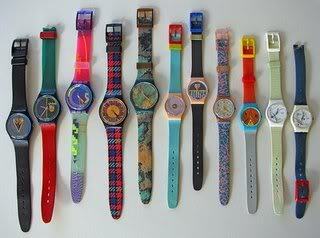 Maybe you were loyal to your Swatch watch? Cael and Graham have been bringing back the '80s the last few days. No, they're not sporting stone-washed denim or growing a mullet, but they have been pulling a "SIKE!" on me all day. Do you remember this phrase? In the '80s, and only if you were really, REALLY cool, you would tell someone something that wasn't true and then yell "sike!" in the same manner you'd say, "not!". As cool and my boys are, they aren't actually saying this to me-- they're doing one better and bringing the phrase to life by causing me to believe one thing before revealing that its not true. As I mentioned yesterday, our home is being plagued by the beginning-of-fall cold that has fallen upon most everyone in town. But while I've got the scratchy throat, Cael and Graham have the cough. And man, oh man, is it bad. It's not that juicy junk-in-the-trunk lungs cough that beckons for antibiotics, rather they've both developed a truly impressive seal-bark sounding cough that is indicative of croup. Thankfully, I know that my kids get this frequently and easily and it usually goes away on its own, but after a few days of it worsening rather than improving, I was growing concerned. Yesterday I attempted a trip to the grocery store to get a few items for lunch but about halfway through the trip I realized that all I'd accomplished was to bottle their sickness in the car and expose the rest of us. Graham seemed to be falling harder than Cael and whimpered and cried as we approached Target. I told him to "take a chill pill" but nothing seemed to make him happy and each coughing fit left him with tears in his eyes, and I'd had enough. Time to call the doctor. Something you need to know in order to understand this story is that my children practically live at the doctor. During cold and flu season we rotate between infected organs like a group of mall chicks trying on each others' Esprit and Guess clothing. When I walk into the clinic, I am always met with a look of, "What is it this time?" or "Back so soon?". I mutter under my breath that I would certainly rather be somewhere else and flash them a look that says, "Gag me with a spoon, lady." Over the summer, thankfully, we generally manage to stay healthy. In fact, we haven't been to the doctor since April, so this visit was like a mini-reunion of sorts, and everyone commented on how much bigger the boys have gotten since our last visit. But as soon as we walked in the door, Cael and Graham pulled their "sike" on me. I was expecting a steroid for the croup and would not have been surprised to find that one or both of them was cooking up an ear infection or tonsilitis. But they immediately put on their happiest faces and giggled together as we waited for the doctor. When he walked in, they were busy entertaining themselves, and he checked them over individually. "They sure look healthy, don't they?" "Yes, but they've both got a really croupy cough and haven't been sleeping well," I commented. "We can give them a steroid for the croup, but I think what you are dealing with is a plain old cold." The boys smiled up at him as if begging for candy, and he tousled their hair as he walked out. What is it about kids that makes all illness symptoms disappear upon entering the doctor's office? For a brief moment, I considered the possibility that they might actually have gotten over the cough in the few moments we were waiting, but I quickly dismissed that hypothesis when we got into the car and both started a coughing jag and Graham moaned "Maaamaa....!" We are now two days into their steroid and I am left to wonder which is the lesser of two evils... the croup or the steroid? My healthier boys are jittery and anxious with 3 remaining days of medicine in the bottle. It's not a pretty scene. 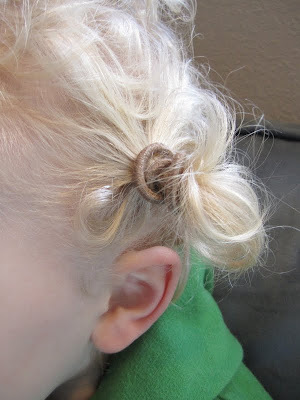 Well, not as pretty as Cael with a sideways ponytail. Like, for sure. Oh, I hate that. One minute your kids is dying, walk into the doctors office and they seem the epitome of health. And I pity you for 2 children on steroids...yikes! I know! They have a sixth sense about it. And it's not like the alternative was shots... there was no reason to avoid the truth! They did not cough once in the office but UNLOADED in the car. Nice. Shawna- What is it about the doctor's office that brings out the best in them? Instead of getting a babysitter, I think I'm dropping Cael off at the clinic when Joel and I need a night off. Never mind the needles and drugs. Sounds like Lee hasn't fallen prey to the switch-a-roo very many times. Sorry, Daddy!